Spring has passed and the summer heat is on…Your roses are past their first bloom but that doesn’t mean they’re done. Summer is a great time of year for roses to be in their prime. The warm dry heat deters the mildew that plagued them all spring and encourages bloom production. 1. MOST IMPORTANT!! WATER WATER WATER!! Roses are very thirsty plants. Be sure you adjust your sprinkler systems and increase either the duration or the frequency of your water cycle in the rose garden. If you hand water, soak them well at least three times a week…more if the heat really goes up. 2. 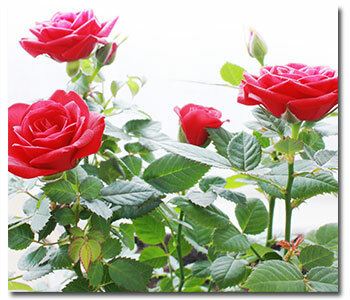 Add a nice mulchy, Organic, soil additive around your roses such as Gardner & Bloome Soil Building Compost. Using a soil optimizer such as John and Bob’s is also recommended. 3. Summer Prune and fertilize. Prune 1/3 of the bush toward the end of August to promote a good fall bloom. Use Grow More Magnum Rose Food. This will increase the frequency and quality of flower production. For the all-organic grower, use Dr. Earth Rose & Flower Food. 4. Spray with a good organic fungicide and insecticide combination such as Green Light Rose Defense to fight summer rose pests and summer plagues such as rust and black spot. Last , but not least, enjoy your roses! Cut single stems and place them in bud vases all throughout the house or arrange them in huge Renaissance bouquets for your hall table. Dry the petals and scent with rose oil then place them in baskets and crystal bowls. Decorate summer cakes with a ring of rose buds and ferns. There is no other flower that blooms so profusely and often..and summer is the season to savor them!